While the birds are finally chirping again in Hamilton, they are also nesting. It is important to keep an eye on the nests that pop up near your home to avoid damage to your property and danger for the birds, who will often build a nest in an area that is unsafe or unsuitable to call home. Removing a bird nest is a tough decision as there are many local laws that pertain to wildlife removal. You can be sure that it is safe and legal to remove a bird nest when it has been abandoned after breeding season has ended, or if it has begun to obviously deteriorate on its own. 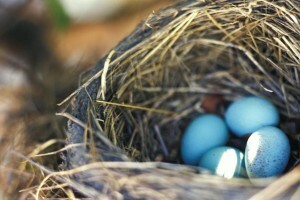 If a nest does not have eggs in it but is in a dangerous location, it should also be removed. If eggs are present in the nest, contact a bird rescue organization to see if they can take in the birds until they are mature enough to leave the nest, or else move the nest as little as possible to put it in a safer location nearby. If the nest is not too far and has not changed dramatically in scent or appearance, the parent birds will return and continue to raise their young. However, there are some nests that should not be moved regardless of the circumstance. If the bird is endangered or if it is a large bird that reuses nests for many years the nest should not be touched. If you have any doubts, contact wildlife officials to get a clear answer about your exact situation before taking action. Not only can nests cause damage to your home, the prevalence of bird droppings is also extremely toxic and dangerous. Nests can damage roofs by clogging drainage systems and causing roofs to collapse as well as wear and tear caused by nests long term on shingles. Bird droppings can also deteriorate roof tops as well as industrial equipment, siding, insulation and vehicle finishes and paint. The acidity can eat away at a variety of materials used in construction and automobiles. It’s just not a good situation for both people and birds. This entry was posted in Blog on 2015/04/07 by Any Pest.